[Source: University of Arizona] – On Friday, October 5, 2012 from 8 a.m. to Noon, you are invited to attend the grand opening of the newest addition to the Phoenix Biomedical Campus – the Health Sciences Education Building. The 268,000 square-foot, copper-faced structure will play a critical role in the education of the next generation of science and health professionals. The 268,000 square-foot building is home to the University of Arizona and Northern Arizona University health sciences programs. Program: 8 to 9 a.m., Breakfast and Tours; 9 to 10 a.m., Program; and 10 to Noon, Tours. For further information, contact Sheila Maddox. To RSVP/register, click here. Special guests: City of Phoenix Mayor Greg Stanton, The Arizona Board of Regents, University of Arizona President Ann Weaver Hart, and Northern Arizona University President John D. Haeger. Do a Google image search of the man who plans to develop the world’s largest health-care data center in Phoenix and two major figures crop up. One is Dr. Patrick Soon-Shiong, dedicated to shrinking the time it takes to get drug discoveries from a laboratory to the hands of medical providers to save lives. In the medical field, he is considered a visionary. The other is Magic Johnson, retired star of the Los Angeles Lakers. Soon-Shiong, an avid basketball fan, bought Johnson’s 4.5 percent share of the Lakers last year. Despite living in Los Angeles, Soon-Shiong, 59, has poured millions of dollars into the Arizona economy. In 2009, he opened a nanotechnology manufacturing plant in west Phoenix that produces a chemotherapy treatment for breast-cancer patients. This week, Mayor Phil Gordon announced Soon-Shiong would be investing even more in Phoenix as the doctor opens his non-profit Institute for Advanced Health downtown, helping boost the city’s image as a hub for the biomedical industry. Forbes estimates Soon-Shiong has a net worth of more than $5.2 billion, ranking him 196 out of the world’s more than 1,100 billionaires. Soon-Shiong has developed several life-saving drugs and cancer treatments. He goes by many labels: doctor, inventor, philanthropist and entrepreneur. When medical breakthroughs are made, it could take more than 15 years to get that discovery from the lab to an actual patient for treatment. The Institute for Advanced Health is part of Soon-Shiong’s vision of streamlining the delivery of health care in America by creating a centralized database that houses biomedical information so hospitals and health-care providers can access the most up-to-date information on patients and how to treat specific conditions. Philip Schneider, clinical professor and associate dean for the College of Pharmacy at the University of Arizona, predicted Soon-Shiong’s investment in downtown Phoenix would help grow the bioscience industry in Arizona. “Dr. Soon-Shiong is well-known for his vision of making patient information much more widely available to other caregivers and improving the exchange of information,” Schneider said. At an international technology conference in Florida weeks ago, Soon-Shiong wowed the audience as a keynote speaker, discussing his hopes of connecting medical research with the care patients receive and how medical providers are paid for the treatment. He showed videos of a shaking Parkinson’s patient using new technology to control his body and walk smoothly across a room. He had a demonstration of a chip for the blind that allowed one visually impaired patient to walk a red line marked on the ground. “It would be one thing if Soon-Shiong simply wanted to point the finger at a broken system and then ramble on about rainbows and unicorns, but the lofty concepts he’s been toiling over are already being implemented in the real world,” Wireless Week wrote about Soon-Shiong’s 40-minute speech. Soon-Shiong is the CEO and chairman of several other enterprises, including the Chan Soon-Shiong Family Foundation and the Healthcare Transformation Institute, and founder of the National Coalition for Health Integration, according to his biography. He graduated from high school at 16 and earned his medical degree at 23. He was born and raised in South Africa, the son of immigrants who fled China during World War II. Last fall, he sold his company, Abraxis BioScience, for $2.9 billion. Jeffrey Trent, president and research director of the Translational Genomics Research Institute, said several notable health-care professionals had put their faith in Phoenix. Among them are former Mayo Clinic CEO Denis Cortese, who assumed a position at Arizona State University in January 2010, and Nobel Prize winner Lee Hartwell, head of the Arizona-based Partnership for Personalized Medicine. Trent said Soon-Shiong’s work would help Phoenix advance in the field of personalized health care. “It brings together a terrific, focused collection of people with great knowledge in the biomedical and health-care world,” Trent said. ASU’s College of Nursing & Health Innovation will host the inaugural “Have a HeArt” benefit on Friday, February 25 from 6 to 9 p.m. to help fund the university’s four nonprofit clinics around the Valley, collectively known as NP Healthcare. The benefit, featuring heart-healthy food and drink, live entertainment and silent auction prizes, also aims to educate guests about the clinics and how they can be utilized as part of a healthy lifestyle. ASU's College of Nursing & Health Innovation. Photograph by Yuri Artibise. On-site nutritional analysis and advice on what food to keep your heart healthy and to fight specific diseases will be offered as well as tours of the 4,000-square-foot health center at ASU’s Downtown Phoenix campus. Silent auction prizes feature exceptional works from local artists, including photography by Marilyn Szabo and jewelry by Heidi Abrahamson. Goods and services from noted local businesses, from the Clarendon Hotel, to the Phoenix Art Museum and many others, are also up for grabs. The NP Healthcare provider staff includes practitioners who specialize in family practice and behavioral/mental healthcare. Services include men and women’s health exams, counseling and mental healthcare, minor illness care, prescriptions for medications, chronic disease management, family planning, healthy lifestyles education, stress management, tobacco cessation, nutrition advice, on-site EKG, sexually transmitted infection testing/treatment and referrals to other medical and health services. Patients can use their health insurance to pay for services as well as cash, credit card, Sun Card or have their student account charged for the cost of the services. For employers, the NP Care members enjoy access to quality and accessible basic health services for a fixed office visit fee and discounts on tests performed at outside labs. Tickets for the event start at just $25. Purchase online here. The ASU College of Nursing & Health Innovation is located at 500 N. 3rd St. on the ASU Downtown campus (light rail at Central Station). Wednesdays February 16 & 23 March 2 & 9. 6 – 8 p.m. The Mini-Medical School of the University of Arizona College of Medicine-Phoenix is a four-week program loosely modeled after the curriculum at the University of Arizona College of Medicine. The lectures are designed to be fun and informative. There is no late-night cramming, long exams or long hours at this school. Just bring your curiosity, sit back and enjoy! Lecture topics subject to change due to availability of presenters. Dates: February 9 & 23 and March 2 & 9. The University of Arizona College of Medicine – Phoenix and Phoenix Children’s Hospital [recently] announced an agreement to expand their affiliation, a move designed in part to address Arizona’s severe shortage of pediatricians. Under the agreement approved by the Phoenix Children’s Hospital board of directors on July 29 and the Arizona Board of Regents on Thursday, the College of Medicine – Phoenix designates the hospital as its principal pediatric affiliate while the hospital names the university as its principal academic affiliate. The hospital is in the midst of an exciting expansion that will make Phoenix Children’s one of the largest free-standing children’s hospital in the nation. “During the course of our expansion thus far, Phoenix Children’s has had to recruit many of our pediatric specialists from out of state. But this new affiliation allows us to train and retain our own top talent,” added Murray Pollack, MD, Chief Medical and Academic Officer for Phoenix Children’s Hospital. The two entities plan to step up collaborative research projects and expand the breadth and depth of research conducted in Arizona to prevent, cure and treat childhood diseases and injuries. “Phoenix Children’s has long been conducting cutting edge research and this affiliation with the University of Arizona – and the tremendous amount of research infrastructure that comes along with it – will allow us to jointly take pediatric research in Arizona to the next level,” said Robert L. Meyer, President and CEO of Phoenix Children’s Hospital. The College of Medicine–Phoenix just admitted its fourth class and now has 168 students enrolled in the four-year program in Phoenix. According to William Crist, MD, vice president of health affairs for UA, this agreement sets the stage for an aligned and collaborative pediatric research program as well as providing groundwork for coordinated medical student and graduate medical education programs. Phoenix Children’s Hospital is Arizona’s only licensed, freestanding children’s hospital, providing world-class care in more than 40 pediatric specialties to our state’s sickest kids. Though Phoenix Children’s is one of the 10 largest children’s hospitals in the country, rapid population growth in Arizona means the hospital must grow as well. Phoenix Children’s recently announced 50 percent completion of a $588 million expansion plan to bring its special brand of family-centered care to even more patients and families. The plan includes a significant upgrade to the Hospital’s current campus, an aggressive physician recruitment effort, and new satellite centers in high growth areas of the Valley. The University of Arizona College of Medicine – Phoenix is the only MD degree-granting college in the metro Phoenix area. The college is part of the University of Arizona College of Medicine which began in 1967 in Tucson. The college today encompasses full, four-year medical-education programs in Tucson and in Phoenix. 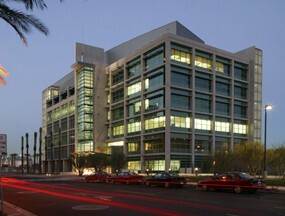 The College of Medicine – Phoenix now plays host to 168 students and will graduate its first four-year cohort of students in May 2011. The College of Medicine – Phoenix is housed in the historic Phoenix Union High School buildings owned and renovated by the city of Phoenix and is part of the downtown Phoenix Biomedical Campus. [Source: Anne Ryman, Arizona Republic] — When the University of Arizona opened a college of medicine in downtown Phoenix in 2006, the endeavor was hailed as a national model, given the heavy involvement of its long-standing rival, Arizona State University. Now, a scant three years later, that partnership is likely ending — the latest victim of state budget cuts. ASU officials confirmed that they plan to pull out of the project and that early next month, the Arizona Board of Regents will vote whether to give full operating responsibilities for the school to UA. [Source: Angela Gonzales, Phoenix Business Journal] — Cigna Medical Group is opening a CareToday clinic in downtown Phoenix. This will be Cigna’s ninth CareToday clinic in the Valley. Construction workers are refurbishing a 1,400-square-foot space formerly occupied by Quizno’s on the northwest corner of Central Avenue and Adams Street. Plans call for opening the new facility in May. Cigna officials said they chose the spot because of an increase in growth and activity downtown. [Source: Ryan Randazzo, Arizona Republic] — The University of Arizona’s Phoenix medical school will build a $15 million underground laboratory with a grant from the National Institutes of Health, the school has announced. The college, which is a partnership with Arizona State University, will use the new building as a support facility for the existing research labs in downtown Phoenix. The college won the grant through the NIH’s federal stimulus program. 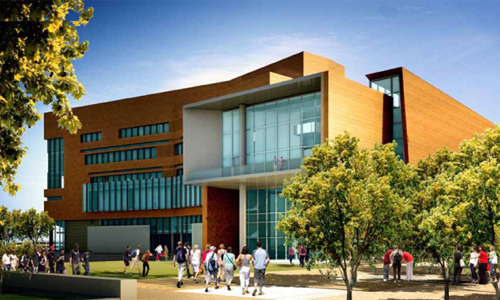 Both UA and ASU researchers will benefit from the new facility. The building is planned for a lot in downtown Phoenix at the existing college bounded by Fifth, Seventh, Fillmore and Van Buren streets, UA spokesman Al Bravo said. It will be built mostly underground to take advantage of sustainable-building principles. Officials could not say when work will begin on the project. The construction and planning is expected to create 250 jobs. When complete, the building will house about 33 new employees, mostly research assistants, Bravo said. [Source: Ken Alltucker, Arizona Republic] — After months of review, the Arizona Biomedical Research Commission last week signed off on a new contract that ensures continued funding of [the downtown] Phoenix-based Translational Genomics Research Institute. The commission sought the new contract with TGen to protect Arizona’s interests in the wake of TGen’s alliance with Grand Rapids, Mich.-based Van Andel Institute. Under the alliance, both TGen and Van Andel retain their locations, research staffs, and boards of directors. TGen filed amended corporate documents last month with the Arizona Corporation Commission that reflect the change. TGen is now a member-based organization instead of director-based organization, and Van Andel’s research arm, the Van Andel Research Institute, is the sole member of TGen. TGen representatives said the new structure gives Van Andel shared control of TGen. TGen receives undisclosed funding from Van Andel. [Source: Angela Gonzales, Phoenix Business Journal] — Plaza Cos. has sold Phoenix Biomedical Plaza to University of Arizona Foundation for $9.85 million, after it paid Ribomed Biotechnologies Inc. about $10 million two years ago for the 2.62-acre parcel. The property, which includes a vacant 33,000-square-foot biomedical building, sits on the northeast corner of Van Buren and Seventh streets, just across the street from the Phoenix Biomedical Campus. That campus houses the medical school jointly developed by UA and Arizona State University as well as the headquarters of the Translational Genomics Research Institute.